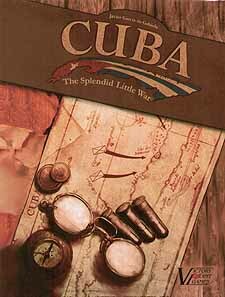 Cuba: The Splendid Little War, 1895-1898 is a two-player simulation of the Third War of Cuban Independence. One player controls the forces of Spain, fighting to retain colonial control of Cuba. The other player controls the Cuban rebels fighting for their independence, as well as the US forces that may intervene in the conflict against Spain - expanding the struggle into the Spanish-American War. Gameplay represents the main insurgency and counterinsurgency operations of the conflict, both military and political, with players making key strategic decisions to achieve their objectives while balancing resources and preventing their enemy from doing the same. The playing area features a map portraying Cuba and the surrounding sea areas. Each Game Turn represents roughly half a year in time. Military unit counters represent either naval fleets, or ground formations several thousand troops strong.